This book provides the first analysis and synthesis of the evidence of the earliest inhabitants of Asia before the appearance of modern humans 100,000 years ago. Asia has received far less attention than Africa and Europe in the search for human origins, but is no longer considered of marginal importance. Indeed, a global understanding of human origins cannot be properly understood without a detailed consideration of the largest continent. In this study, Robin Dennell examines a variety of sources, including the archaeological evidence, the fossil hominin record, and the environmental and climatic background from Southwest, Central, South, and Southeast Asia, as well as China. He presents an authoritative and comprehensive framework for investigations of Asia's oldest societies, challenges many long-standing assumptions about its earliest inhabitants, and places Asia centrally in the discussions of human evolution in the past two million years. 1. 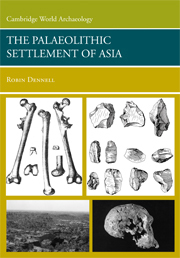 Asia and its place in palaeoanthropology; 2. The African background to the colonisation of Asia; 3. The climatic background to hominin settlement in Asia before a million years ago; 4. The earliest inhabitants of Southwest Asia; 5. The earliest inhabitants of South and Southeast Asia, and China; 6. 'Out of Africa 1' reconsidered and the earliest colonisation of Asia; 7. The climatic and environmental background to hominin settlement in Asia between ca. 1 Ma and the last interglacial; 8. The Middle Pleistocene archaeological record of Southwest and Central Asia; 9. The Middle Pleistocene archaeological record of the Indian sub-continent; 10. The archaeological record of China and Southeast Asia ca. 800–125 ka; 11. Human evolution in Asia during the Middle Pleistocene.